Deep sea creatures come with all kinds of strange features that help them to survive their cold, dark habitat.. Some have eyes the size of a basketball, others come with appendages that blink and glow, deep-sea dwellers have developed some strange features and the "cockeyed" squid Histioteuthis heteropsis has one normal eye and one giant, bulging, yellow eye. Now, biologists say they have gathered the first behavioral evidence to show the two mismatched eyes evolved to spot two different sources of light available in the deep sea. The large is adapted for gazing upwards, searching for shadows of fellow sea creatures against fading sunlight, while their small one is adapted for gazing downwards, scanning deeper water for bioluminescent flashes. By watching cockeyed squids glide and pirouette through more than 150 undersea videos collected by the Monterey Bay Aquarium Research Institute (MBARI), Thomas has gathered the first behavioral evidence that the squids' lopsided eyes evolved to spot two very different sources of light available in the deep sea. "You can't look at one and not wonder what's going on with them." said Duke University biologist Kate Thomas. "The deep sea is an amazing natural laboratory for eye design, because the kinds of eyes you need to see bioluminescence are different from the kinds of eyes you need to see the basic ambient light. In the case of the Histioteuthis, this cockeyed squid, they chose one eye for each." said Sönke Johnsen, professor of biology at Duke University and senior author on the study. " 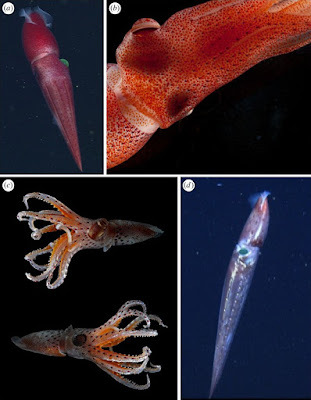 Also known as the strawberry squid for its bright pink color and smattering of seed-shaped photophores, this squid lives in a region of the ocean known as the mesopelagic or "twilight" zone, 200 to 1000 meters below the surface. The little light reaching these depths is extremely dim, a monochromatic blue, and travels straight down from above. Often, the bioluminescent flashes of other sea creatures -- which could signal danger or potential prey -- are brighter than the ambient sunlight. Since their discovery over a hundred years ago, cockeyed squids' mismatched eyes have puzzled biologists. To gain insight into their behavior, Thomas, a graduate student in Johnsen's lab and lead author on the paper, combed through 30 years of videos collected by MBARI's remotely operated vehicles (ROVs), which documented 152 sightings of Histioteuthis heteropsis and nine sightings of its similar but rarer cousin, Stigmatoteuthis dofleini. 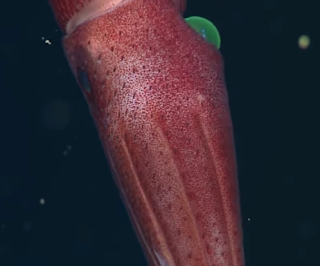 She found that these "lazy, slow-moving" squid prefer to drift through the sea in a pose that might appear upside-down to us land-lubbers -- head down and tail up -- but nearly vertical, with the big eye consistently oriented upwards, and the small eye consistently oriented downwards. (d) an adult S. dofleini (ROV image). Using visual simulations, Thomas showed that, because the sunlight only comes from directly above, it would be nearly impossible for an eye angled downwards to spot silhouettes against the ambient light. Similarly, while increasing the size of an upward-facing eye a small amount greatly improves its sensitivity to dim sunlight, increasing the size of a downward-facing eye has little impact on its ability to spot bioluminescent flashes against a dark background. "The eye looking down really only can look for bioluminescence. There is no way it is able to pick out shapes against the ambient light. And once it is looking for bioluminescence, it doesn't really need to be particularly big, so it can actually shrivel up a little bit over generations. But the eye looking up actually does benefit from getting a bit bigger." Johnsen said. Sporting two gigantic eyes may seem like the ultimate strategy for surviving the deep dark sea. But where resources are sparse, the cockeyed squid may have stumbled upon an ingenious solution to an ocular conundrum, Thomas said. "Eyes are really expensive to make and maintain. You want eyes just big enough to do what you need to do, but you don't want to have any bigger eyes because then you are just wasting resources." Thomas said. The light environment of the mesopelagic realm of the ocean changes with both depth and viewer orientation, and this has probably driven the high diversity of visual adaptations found among its inhabitants. The mesopelagic 'cockeyed' squids of family Histioteuthidae have unusual eyes, as the left and right eyes are dimorphic in size, shape and sometimes lens pigmentation. This dimorphism may be an adaptation to the two different sources of light in the mesopelagic realm, with the large eye oriented upward to view objects silhouetted against the dim, downwelling sunlight and the small eye oriented slightly downward to view bioluminescent point sources. We used in situ video footage from remotely operated vehicles in the Monterey Submarine Canyon to observe the orientation behaviour of 152 Histioteuthis heteropsis and nine Stigmatoteuthis dofleini We found evidence for upward orientation in the large eye and slightly downward orientation in the small eye, which was facilitated by a tail-up oblique body orientation. We also found that 65% of adult H. heteropsis (n = 69) had yellow pigmentation in the lens of the larger left eye, which may be used to break the counterillumination camouflage of their prey. Finally, we used visual modelling to show that the visual returns provided by increasing eye size are much higher for an upward-oriented eye than for a downward-oriented eye, which may explain the development of this unique visual strategy.This article is part of the themed issue 'Vision in dim light'.